Partly cloudy skies. Low 39F. Winds NW at 10 to 15 mph.. Partly cloudy skies. Low 39F. Winds NW at 10 to 15 mph. Researchers from Brigham and Women’s Hospital and Harvard Medical School looked at data from folks in the REDUCE-IT trial who had elevated triglycerides (150-499 mg/dL) and were taking a statin to prevent or control cardiovascular disease. When participants were given 2 grams twice a day of the prescription EPA called icosapent ethyl, they saw their risk of a first heart attack plummet by 25%, second events by 32%, third events by 31% and fourth or more events were cut nearly in half. The EPA also prevented 1 in 5 cardiovascular-related deaths. Your takeaway: If you have persistently elevated triglycerides, ask your doctor about icosapent ethyl. Everyone, with or without risks of heart disease, should enjoy EPA-rich salmon and ocean trout (and algae). Chinook salmon, for example, contains 1.01 grams (that’s 1,000 mg) of EPA per 3-ounce serving. Don’t short change yourself on other forms of omega-3: DHA is also found in fish such as salmon, and ALA is in flaxseed, canola and soybean oil, nuts and dark leafy veggies. EPA, DHA and ALA all help prevent or control high blood pressure, cardiovascular disease, arthritis, depression, cognitive dysfunction and Type 2 diabetes. 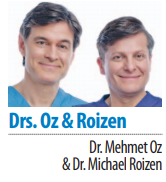 Mehmet Oz, M.D., is host of “The Dr. Oz Show,” and Mike Roizen, M.D., is chief wellness officer and chairman of Wellness Institute at Cleveland Clinic.